Nice. I absolutely loved the various 2.ed black and white Monstrous Compendiums and the art/creature design. Not to mention the ammount of fluff they got. I can still remember how excited I was when I got my hands on this for the first time. It must have been around 1991 or 1992 when I moved from BECMI to AD&D, and for some reason at first I had only the Forgotten Realms MC appendix. I was about 10, and there was no gaming store in my area at that time, nor even a Barnes & Noble, so I had to rely on smaller independent book stores for gaming stuff, and I was at the mercy of whatever they had in stock. So for a long time (at least, it seemed like a long time to my ten-year-old self), I had no stats or descriptions for the basic monsters, which was very frustrating. I'm a big fan of a lot of the 2E artwork, and I must say, those pictures on the cover have been engraved in my mind as the way that umber hulks, beholders, and displacer beasts look. (And a lot of my images of other monsters were similarly hard-coded by the black and white pictures inside). No Huorn, boy! No Huorn! The aerial servant has 16 HD in 1e as well, but many monster increased indeed in strength, notably extraplanar creatures and giants. Especially giants. The damage 1e giants to is laughable by comparisons. I think one guy here once DM'd Against the Giants with 2e stats and made the whole thing even grindier than it already is. Notably extraplanar creatures, giants and DRAGONS, you mean. ...but yeah 2e giants Are vastly more powerful than 1e ones (...and ditto Dragons). Btw the artist did lots and lots of stuff for Rolemaster (2e) as well. Yeah, I loved the idea of the loose-leaf compendia that you could merge in one binder, but the fact that most sheets had a monster on each side completely ruined this. Agreed. Great idea, poor execution. Loved being able to copy new monsters from Dragon and adding them in. The fact that the pages starting falling out later sucked, though. Gave me Unearthed Arcana flashbacks. We continue with herd animals, namely the camel, cattle, buffalo, antelope and sheep. 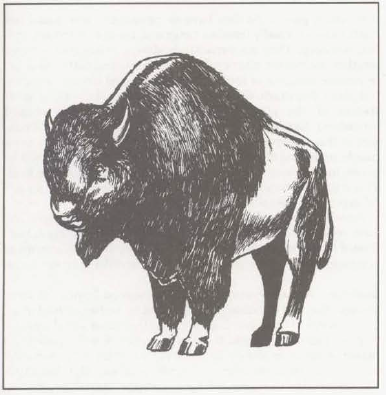 The illustration is alright... except that it's a bison and the bison is nowhere to be found here. I guess it's supposed to be a buffalo. The entry is really short. The actual text barely fills a column and no animal gets an individual description. Then again, none of them is exotic and we don't really expect fancy combat manoeuvres or spell-like abilities from animals. The camel can have one or two humps and survive up to two weeks without water. Depending on your DM, that's purely anecdotal or crucial information. Camels are so mean-spirited that they have a flat 50% chance of spitting at somebody who tries to ride them or use them as a pack animal, which in turn has a 25% chance of blinding the victim for 1d3 rounds. The entry kind of suggests that this happens all the time, so taking a ride on the camels will probably leave half your party blind. Antelopes, cattle and sheep will generally flee rather than fight, unless they are cornered. Due to higher hit points, these can actually be more dangerous than kobolds in melee. The most dangerous thing is causing a stampede, though: If caught, a character takes 1d4 or 1d6 (depends on size) points of damage from 2d4 animals. That's an average of 12 to 17 points of damage. Pretty bad for a low-level character. The buffalo doesn't get any special rules. It's pretty strong, though, and can impale people... even though I'm sure a real buffalo will have a hard time doing that with horns pointing backwards. Bottom line: Nothing exciting, but that's okay for mundane non-dire animals. The "American Bison" is commonly referred to as a Buffalo. An article in Dragon magazine tried to upgrade 1e giants by introducing scaling damage by weapon size, similar to what was codified in 3e. Using a longsword (1d8) as the point of comparison, an ogre-sized longsword would do 1d10+2, one for a hill giant would do 3d4+7, while a fire giant would do 2d8+10, a frost giant would do 2d10+9, a cloud giant's longsword would inflict 3d8+11, and a storm giant's longsword would deal 3d10+12. Bats, one of the standard flying monsters and dreaded for their ability to send people down into bottomless pits... at least in video games. In tabletop RPGs, they still make a decent opponent, albeit one without illustration. The entry also comments on the "common belief that bats are blind". Is that really so common? Bats are known for using echolocation, but I don't recall them as an animal considered blind. And then they say that bats use sonar! I guess sonar doesn't exclude non-marine use, but I have never seen it being used out of that context. Anyway, the first bat is the common bat, which is really just that. It's not particularly dangerous... except when send in swarms. The text also points out that vampire bats (the real life ones) do not drink blood from humans and demihumans as a "true vampire". So, not level drain here and no Evil DM Seal of Approval. Then there is the large (giant) bat, which is medium-sized because D&D is random. Apparently 10% of all bats are oversized, which strikes me as a good portion. Anyone bitten has a 1% chance of contracting rabies. Hey, that might actually be higher in real life. Extremely maneuverable in flight, large bats gain an Armor Class bonus of +3 when an opponent with a Dexterity of 13 or less fires a missile weapon at it. This is a prime example of bad exception-based design, as this basically revises the DEX Missile Attack Adjustment chart right in the middle of combat. It also doesn't make any sense, as low/high DEX already means penalty to ranged attacks for the attacker and better AC for the defender. So why add more modifiers? The last bat is the mobat (names after the antitank weapon of the same name?). The mobat is essentially just another bat, though a very silent one. Its special attack is a scream that forces the hearer to cover his ears. Bottom line: Bats aren't exactly exiting, but make nice supporting monsters.